For three hundred years, from c. 1250 to c. 1550, the Book of Hours was the bestseller of the late Middle Ages and the Renaissance. The core of the Book of Hours is the Office of the Virgin Mary, with its set of prayers to be recited at home eight different times, or hours, of the day, just as monks chanted the office during the eight monastic hours. Books of Hours still exist on the market in greater number than any other type of medieval manuscript. Books of Hours are remarkably varied. Everyday versions were sometimes written on paper with modest ornamentation. Deluxe versions were nearly always copied on fine parchment and richly illuminated with precious gold leaf and lapis lazuli by the best artists of the day. Kings and queens, princes and princesses, doctors, lawyers, merchants, housewives, and even children, who learned to read from them, owned Books of Hours. Wealthy women often received illuminated Books of Hours as dowry presents. Recording in them milestones of family history, they passed them down from generation to generation as heirlooms. Different texts and illustrations are typically found together in Books of Hours. Recited in honor of the Blessed Virgin Mary, the Hours of the Virgin, is illustrated with the Christmas story, made up of scenes from the early life of Christ. Other sets of readings include the Hours of the Cross and the Hours of the Holy Spirit. 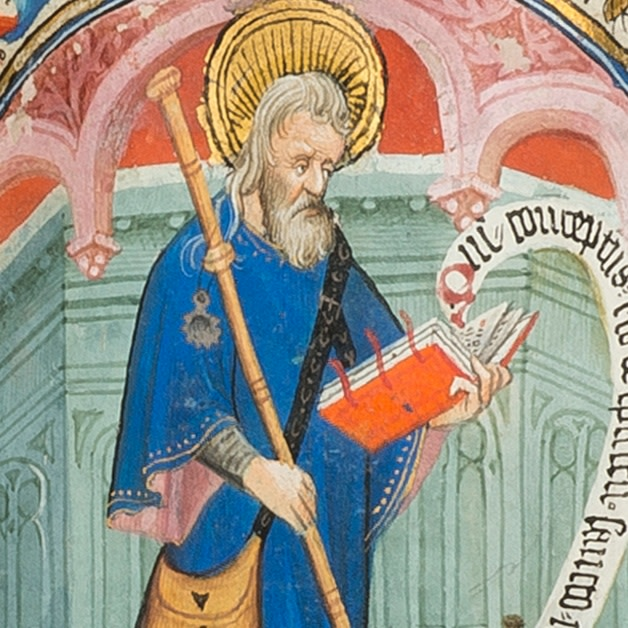 Typically illustrated with an image of King David, the Penitential Psalms were recited to help one resist temptation to commit any of the Seven Deadly Sins (which could land one in hell). The Office of the Dead was prayed to reduce the time spent by one's friends and relatives in the fires of purgatory. A calendar prefaces each Book of Hours. Listing the important feast days throughout the year, calendars frequently include pictures of the Signs of the Zodiac and the Labors of the Month, activities that characterize a particular time of year. Suffrages, or prayers to special saints, were a way of tailoring each book to its owner (Margaret for childbirth, Apollonia for dental problems, Christopher for travelers, and so forth). Every Book of Hours is unique. The texts vary from country to country, region to region, and even town to town, and their liturgical content is referred to as "use" (Use of Rome, Use of Paris, Use of Rouen, etc.). Simple manuscripts without much personalization were probably available from the off-the-shelf stock of stationers in the larger towns, while lavish versions in which the texts and pictures were selected with a particular owner in mind were commissioned often at great expense.